Nut-based and sweet spreads have posted astonishing retail growth figures over the last five years, and sales show no sign of slowing any time soon. Mintel predicts the domestic U.S. market could reach $6.5 billion by 2018. The category encompasses much more than peanut butter. There are popular varieties made from almonds, hazelnuts or alternative bases, such as cashews. Consumers want choice. They’re looking for different flavors, added spices or innovative products that offer health benefits in the form of extra vitamins. Healthy additives and natural ingredients can bump nut butter up to the level of a premium or gourmet spread. AC Horn Manufacturing constructs nut butter mills unique within the industry, mills that allow you to take advantage of market opportunities for premium and gourmet spreads, or ordinary nut butters with extraordinarily smooth consistency. Horn bought Cantrell International several years ago, and entered the nut butter market. Cantrell was the original concept designer of Bauer nut butter mills during the 1920s. Today, even a brand new nut butter mill is often referred to as a Bauer, which is renowned for consistency and longevity. Since the Cantrell International purchase, Horn has adapted and improved the design to provide a high-quality machine that meets industry standards. As if that isn’t enough, add one final feature. As far as durability, our mills can’t be beat. We’re still servicing mills sold to our customers more than 50 years ago. 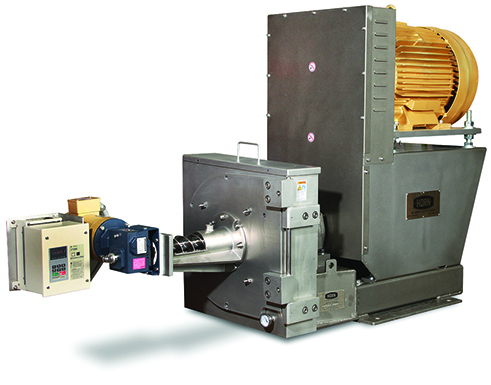 You can rely on AC Horn Manufacturing as your single-source supplier for a complete processing line for nut butter. We can supply all equipment and design an integrated control system. We will provide complete drawing sets and manage the project. You have our guarantee that the project will be finished on time and meet your specifications. System integration: For a fully automated line, this is one of the most critical components. A Horn programmer will design a program custom to your butter line controlled from one main panel. Our system integration ensures continuous, seamless operation, shift after shift. Project management: A complete line will require project management to coordinate the whole project.